Well they thought it would never happen, and when I say they I mean me, or to be more gramatically correct I, but 2010 has at last thrown up a good movie worth seeing. Not worth buying on DVD or anything like that, but definitely worth seeing. I won't go into detail about the man who sat next to me and took his shoes off, instantly incapacitating my olfactory system with his weapons-grade toxic feet, because I doubt you get that with every screening. I must have just been lucky. 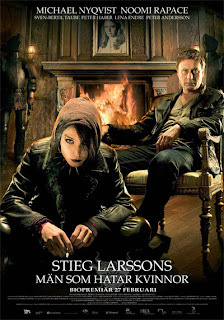 Instead I'll just tell you about The Girl With The Dragon Tattoo and how it is, like, well good and stuff. It's essentially a whodunnit with a bit of whytheydunnit and even some didtheyactuallydunnitatall thrown in for good measure, but it's a cut above your average murder mystery because it's got characters who are actually convincing people with complicated lives and well-developed backstories, which is rarer than a watchable Melanie Griffith performance these days. It's leisurely-paced but never boring; getting to know the characters is just as interesting as finding the next clue in the puzzle, so hooray for that too. It also looks beautiful. It must be mandatory for all Swedish films to be shot through some kind of icy blue/white filter, unless that's what Sweden actually looks like. I wouldn't know, the closest I've been is Ikea and it doesn't look like that. There wasn't a Not Lamp or Benno CD Tower in sight. On the downside there aren't really any major plot surprises; although it occasionally veers towards Se7en-esque territory it's a much smaller story than that so you won't leave the cinema in stunned disbelief. 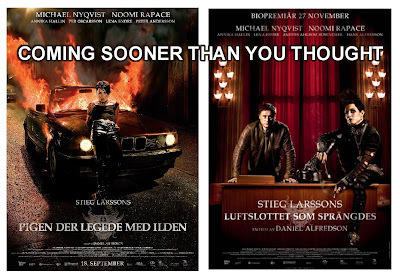 You probably will leave, though, wanting to see the other two films in the trilogy adapted from Stieg Larsson's books, and the good news is that they're coming out in September and November this year, and as The Incredible Suit does like to collect the set I'll be there with nobs on. So well done Johnny Sweden, you've set the benchmark now. Officially The Incredible Suit's Best Film Of 2010 So Far, The Girl With The Dragon Tattoo is the one they've all got to beat. Although Hot Tub Time Machine's out soon so it might be a short-lived victory. The ushers came in and turned the lights on full and started cleaning up around me during the credits while I was listening to the music. Unbelievable. The Swedes don't actually have Ikea. It's just a slighly embarrassing money spinning export only thing, like UK prog music. Just a thought: Have you considered not going to Cineworld Enfield? They do have Ikea in Sweden I'm afraid. I thought I'd better address this burning issue on my FILM blog about FILMS before it gets out of hand. According to Wikipedia, which we all know is 100% correct on everything, Sweden has 17 Ikea stores, including the world's largest. So get back to your humanitarian initiatives Gabriel, you tree-hugging slaphead. Thank you Mr Suit, I knew I wasn't imagining them! Because if the stores that are marked Ikeas are not actually Ikeas then I'd have to start wondering if they are just covering up something much worse....Abba tribute museums or something..
Don't forget I had two vouchers for Cineworld, whose goodwill runs out in June so I had to use them ASAFP. Otherwise I would have been in my private screening room in my pants with the heating cranked up to max. My co-host on the cinematic dramatic podcast loved it. I was too hungover to watch...bit gutted. Andrew, I myself was a cinema monkey in the olden days before child labour was abolished and I am aware of the issues facing the poor buggers who have to sweep up the popcorn that people have paid extortionate amounts for only to spread it around the floor. However at Cineworld Enfield the lights come up THE VERY SECOND the credits start, presumably in order to get people out as soon as possible. Not just unbelievable but unacceptable. Bah. I have been keeping a list of all the movies I see this year in ranked order, I did the same last year. This one actually sits top of my list at the moment. It can’t stay their until the end of the year, my top film last year was Let the Right One In, my list can’t be topped by Swedish films two years in a row. Having read the book I already knew “whodunit” but that didn’t detract from my enjoyment. As for the ikea question one of the characters goes to ikea and furnishes an entire apartment, we get the entire shopping list all using the silly ikea names! LTROI was The Incredible Suit's No. 1 last year too. As much as I enjoyed TGWTDT I can't see it topping the 2010 list. Not when HTTM is almost upon us. KWIM? The icy/blue light you speak of is the Northern Light, characteristic of Sweden.Sven Nykvist, the cinematographer on Through the Glass Darkly said "Ingmar Bergman insisted on 2 months preparation on the film, to study the sparse northern light we have in Sweden and how best to apply it to the story"
The icy blue light you speak of is the Northern Light, characteristic of Sweden. What Is This, Some Kind Of Competition?